Men's Retro 1960s Mod herringbone check three quarter length dress coat in grey. Fab flashes of colour in the form of check strike throughs add a cool Vintage texture to this tailored herringbone dress coat. 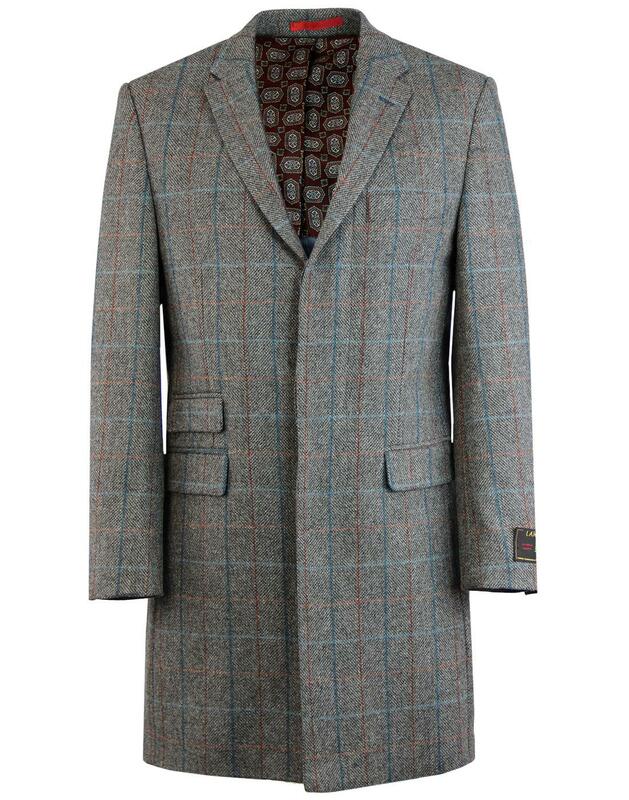 Boasting a luxury 100% wool construction for warmth in the colder seasons, Retro slim notch lapel and a cool Psychedelic 60s paisley lining. Two flap side pockets, Mod right side ticket pocket and left side breast pocket. Three button non-working cuffs. A hint of contrast blue stitching finishes the coat off in style. Team with a smart shirt and trousers for a classic tailored look. Shades of Vintage 1950s Teddy Boy styling with in a classic Mod cut. - Men's 60s mod tailored herringbone check dress coat in grey. - Multi colour check strike throughs on textured herringbone ground. - 4 concealed button single breasted fastening. - Slim retro notch lapel. - S17548SV Herringbone Check Three Quarter Length Dress Coat.